Germany is only 900 km away, Copenhagen is a three-hour train ride away, and from Stockholm it’s a five-hour-drive. Småland is closer than you might think, easy to access and travel around. It’s also a landscape with a great variation of activities for kids. Here are some tips if you want to spend quality time outdoor with your kids and family in Småland. You can find more suggestions here. 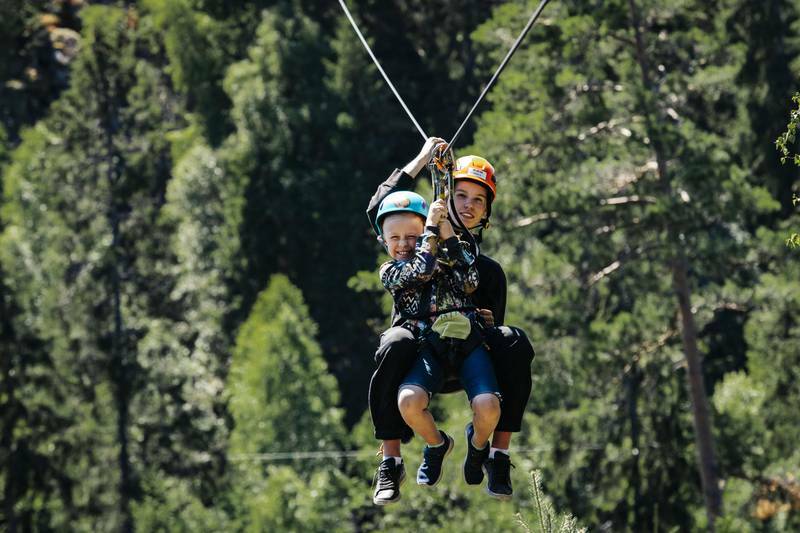 Little Rock Lake is the longest zipline adventure in Europe with a total length of about 4,7 km and several stations including towers, mountain walls, platforms in trees and wooden structures. You can choose between three different ziplines. The Green/Blue Zip is family friendly, with 1 km spread over seven stations. Children can tandem zip with guides, and in some parts of the course at Little Rock Lake you can parallel-zip. There are enough lakes and waterways in Småland to fulfill everybody’s wishes. You can quietly glide between the islets in a sea kayak in the Baltic outside Västervik, or experience the beautiful landscape of Småland by canoe. 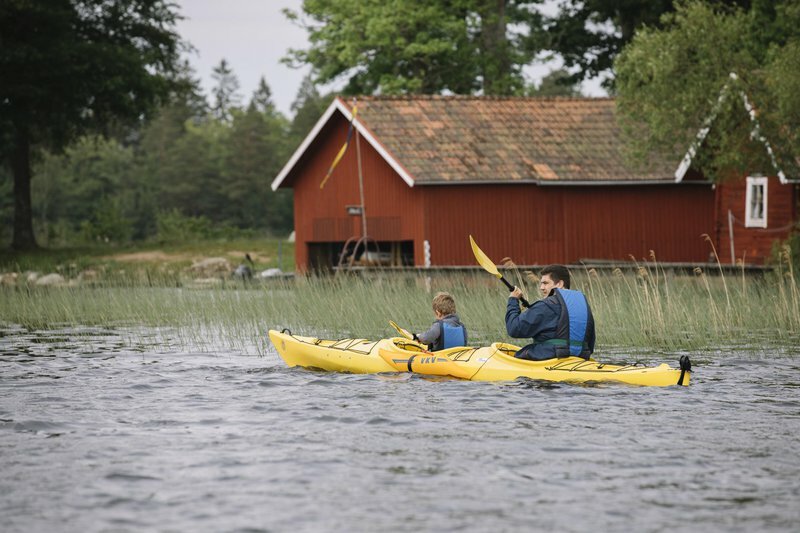 You can also rent kayaks or canoes and explore big lakes such as Åsnen, or idyllic streams like Ronnebyån where you should make a stop in Korrö. Just decide your own pace and sections, but remember: kids in canoes/kayaks can easily become restless. Make sure to plan plenty of stops along the way. Get that kid a fishing rod – and have a great time together. In Småland you will find lakes and waterways of various sizes that offer a large variety of species. The most myth-enshrouded game fish, the pike, is present not only in great abundance, but also often grows large here. The same applies to the perch. Getnö Gård Lake Åsnen Resort at Lake Åsnen offers family friendly fishing and camping, as well as a fishing school for children. Alsterån offers scenic trout fishing. The Ödevata Fishing Camp offers a wide range of beautiful inland lakes of varying character. Everything from shallow clearwater lakes to forest lakes. There are plenty of beautiful camping grounds in Småland. Around Åsnen, for example, there’s around a dozen. Just outside Kalmar there is Vita Sands camping by the shores of the Baltic sea with plenty of activities for kids. Isaberg Mountain Resort has mountain bikes, an obstacle course, canoes, SUP and many more activities to offer. Kosta, Tingsryd, Getnö, Havslätt, and Hätteboda Wilderness camping are some other examples. Just remember: you only need a simple tent to create an unforgettable nature experience for a kid. Sometimes not even that; cowboy camping under the stars can also be a great adventure! Cycling is a great way to discover Småland! You can cycle round lakes and explore islands, forests and towns, or the islands in the Västervik archipelago. Choose a route of suitable length, and explore the surroundings together. The cycle route around Lake Åsnen is roughly 140 km long. Parts of the lake is designated as a national park because of its unspoilt archipelago. Around half the trip is along car-free trails and follows old railway embankments. Sydostleden is Sweden’s second national bike trail and is 270 km long. The trail takes you through varied landscape and offers many unforgettable experiences along the way. North-west Småland’s Stråkenleden is the perfect family hiking route; while not steep, it still offers magnificent views. The route is 9 km, with plenty of places to swim along the way if you fancy a dip! Store Mosse National Park – Sweden’s biggest bog south of Lapland has more than 40 kilometers of footpaths and a unique flora and fauna. You can easily make a shorter day-hike with the family along the trail. And last but not least; Astrid Lindgren’s much-loved Emil stories can be traced through a trail. Emil-Leden is a 4-km circular hiking trail through the villages and fields between Mariannelund and Lönneberga.